Therefore, this investing strategy doesn’t only generate a constant income stream but it also performs well over time. The secret behind the whole strategy is a simple concept called dividend growth. By building a 3%+ dividend yield portfolio with an overall annual dividend increase of 2-3% minimum, you are also assured to beat inflation over the long haul. In other words, your portfolio doesn’t only generate a 3% dividend yield today but your payout will grow faster than the rate of inflation. This is mainly why dividend growth is at the center of my investing strategy; because it can become the engine of both stock prices and payout increases. In other words; if you can find a company that is continuously increasing its payout and shows metrics ensuring dividend growth sustainability, you just identified an over performing stock for the years to come. 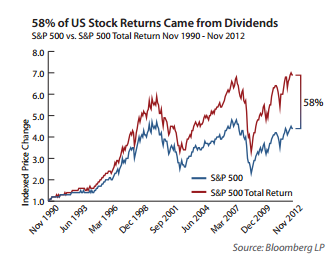 Many great finance research articles have covered dividend investing. 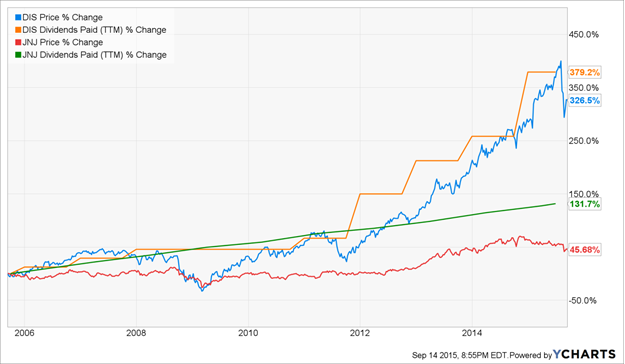 The impact of a dividend increase on a stock price is also very powerful. Aharony & Swary (source) has proven that an increase in dividend usually generates an increase in the price stock of 2% on average. On the other hand, Healy and Palepu (source) has proven that a dividend cut will contribute to drop the stock price by over 9.5% on average. This is why the past, but also the future dividend growth perspectives are very important when determining the choice of a stock in your portfolio. 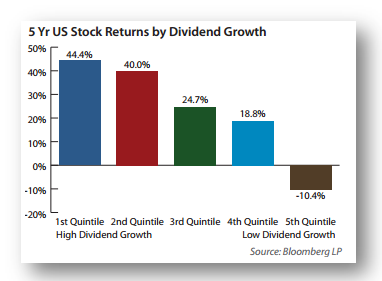 At Dividend Stocks Rock (DSR), I look at dividend growth over 3 and 5 years. I ensure both metrics are positive to ensure that management is dedicated to returning more wealth to investors over time. This is also a great indicator of management’s confidence in the company’s future. As previously mentioned, I also have to consider other metrics to ensure the dividend growth will continue through years. I’m not exactly following the buy & hold strategy recommended by many dividend investors. In fact, half of my portfolio is following the “classic” buy and hold model and the other half is more active as I plan on using both the impact of dividend growth (on the stock price and on the payment itself). I like to build a core portfolio of stocks I would probably never sell but I also like trading a few more stocks in and out to make a healthy profit. Imagine if you could still invest actively in individual stocks while building a rock solid portfolio. Imagine if you could use the fundamental principles of investing without getting bored or having to read hundreds of pages of stock research. ü We manage real-life dividend portfolios and send trade alerts when we buy or sell a stock. ü We provide you with pre-screened stock lists with various metrics. ü We create 1 pager stock analyses to save you time from reading numerous pages of financial information. ü We help you in your valuation process with an excel spreadsheet calculator using a two stage dividend discount model. ü We write a bi-monthly premium investing newsletter to keep you updated on the stock market. If you are interested in learning more about my site, you can check out my 7 dividend investing principles in details here. Let me know what you think! DGI Disclosure: I own shares of DIS, JNJ. This article also includes affiliate links for which we may be compensated.